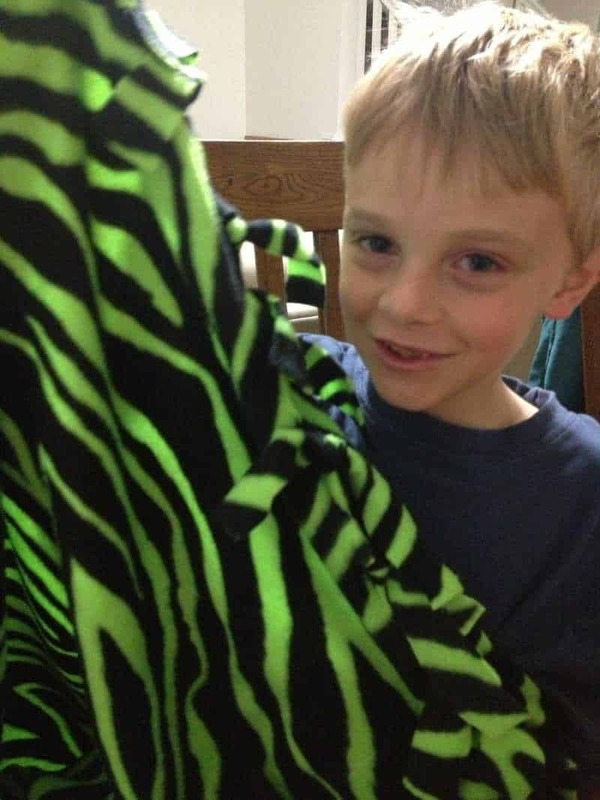 No-Sew fringe blankets are fairly easy to make and fun to cuddle up with. 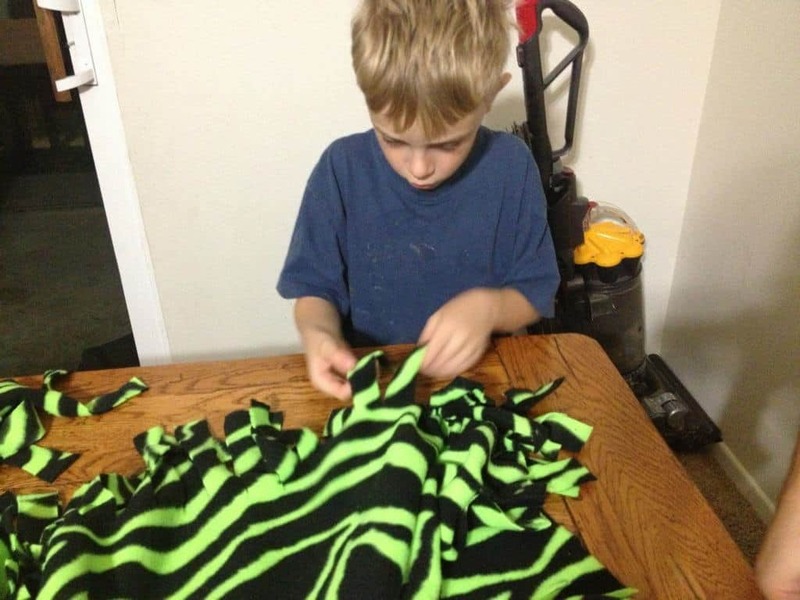 My oldest daughter made a blanket for Caleb when he was born. She was just 6 years old and did most of the cutting and tying herself with my supervision. I guess it partly depends on the dexterity of the child. A few months ago, we decided the twins needed their own big boy blankets since their crib blankets were too small all of a sudden. Clara decided she should make them blankets too. So we all trooped over to the fabric store together before Christmas. Before long every child in my family had decided they needed blankets. We’ve made five blankets in the last month. Caleb is six years old and he didn’t do any of the cutting himself, but he did most of the tying. He is so proud of his new big boy blanket too! He has had the same blanket Clara originally made since he was born. She made it larger then most crib blankets and he has been using other blankets, but he needed a new “favorite” that actually fit well. Jonathan is eleven years old and he did about half of the cutting and most of the tying himself. Cutting with heavy scissors makes your hands and shoulders tired! Even when Clara made the twins their blankets for Christmas I did about half of the cutting just to lighten the load. 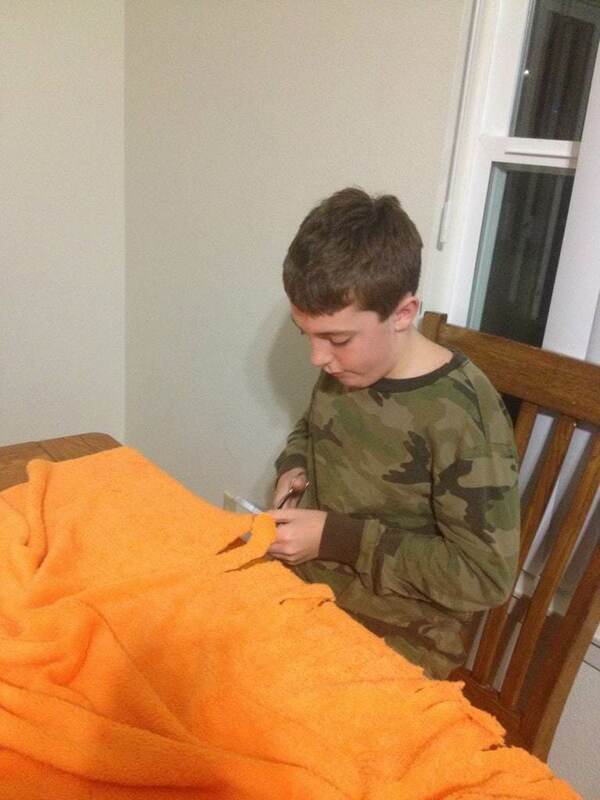 The process of creating a blanket is pretty simple. I bought 2.5 yards of fleece for each blanket. Jonathan’s is actually made out of 2.5 yards of minkee. We trimmed off the outside selvedge edges. One of the edges that needs trimmed has a white strip on the border and the other edge that needs trimmed curls up a bit along the border. After the edges were trimmed, we started in one corner and started making cuts. Each cut is about 4 inches long and about 1 inch wide. We did not even attempt to be precise. Once we cut all along one edge, we started the next edge which cuts the last four strips off from the previous edge. I should have taken a picture of that step but I think it will make sense once you see it in real life. Also, once we finished cutting one edge we found that the tying could be started. 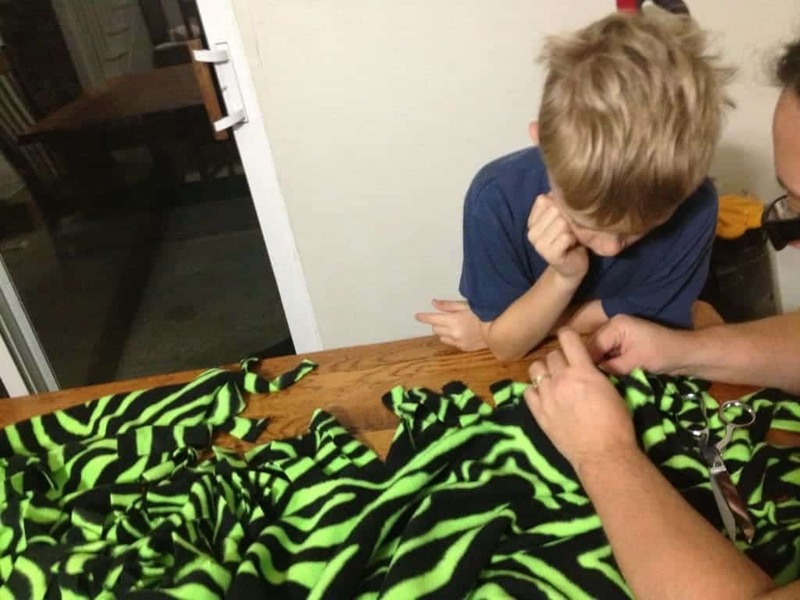 The process of making a fringe blanket is actually great for fine motor skill since both tying and cutting require hand strength and dexterity. We still have one more blanket to make — my oldest daughter still doesn’t have one of her own. My kind of sewing the no sew kind, lol. Love that your are getting your boys involved in such great projects.